RGA has led the planning and design of a broad range of parks, bikeways and recreational trails. Many of our projects were developed with ISTEA funds, and our designs reflect current federal design and accessibility standards. 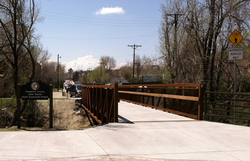 For a list of RGA's Multi-Use Trail and Park Engineering representative projects, click here. 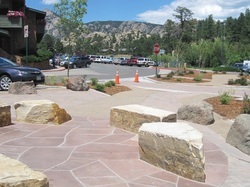 Description: RGA provided design and construction administration for the creation of Town Square park and event space. This included a gazebo with seating area, water fountain/bottle filler, bicycle racks, and walkways. RGA coordinated the design and construction of all civil, structural, electrical, mechanical, and utilities infrastructure. Description: RGA assisted the design team with the reconstruction of Bond Park upgrades and improvements. This project included: storm sewer, channelization and infiltration system to eliminate existing pond of water and other drainage problems; underground conduit bank for irrigation control wires, utilities, fiber options, and electrical system; replacing asphalt pavement with decorative stones; incorporating parking delineation in decorative stone pattern to eliminate typical painted stripes; eliminating curb and gutter; 3-foot high rock boulder bollards to replace typical parking blocks; and flowing curvilinear roadway, sidewalks and planter beds.